Children born with fibular hemimelia have a spectrum of deformity, deficiency, or instability (DDI). The surgical treatment for fibular hemimelia is designed to address all of the deformities, deficiencies, and length discrepancies, specific to each type and the individual patient’s needs. At the Paley Institute, we start with a reconstructive life plan. 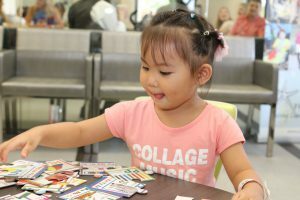 This involves evaluating all of the surgical deformities, deficiencies, and predicting the limb length discrepancy at maturity and then coming up with a surgical plan to correct these in the fewest number of surgeries, spread apart as much as possible throughout the child’s growing years. The first step for treatment is to predict the limb length discrepancy at skeletal maturity. During the initial visit with Dr. Paley, he will obtain x-rays of both lower limbs and measure the lengths of both femurs, both tibias, and the heights of both feet. By comparing the sum of the femur, tibia, and feet height on the short leg with that on the long leg, we can determine the limb length discrepancy at the time of the x-ray. Using the multiplier method for limb length discrepancy prediction (a formula developed by Dr. Paley in 2000), we can calculate the limb length discrepancy at skeletal maturity. Additional measurements throughout the patient’s life will improve the accuracy of the prediction. Once the predicted limb length discrepancy at skeletal maturity has been calculated, a determination on the number of limb length equalization surgeries can be made. Under the age of four, it is safe to lengthen up to 5 cm (~2 in.). As the patient ages, subsequent lengthenings can be as high as 8 cm. If additional equalization is required, one can also consider a limb growth-slowing procedure, called an epiphysiodesis. The epiphysiodesis involves slowing the growth of the long leg to allow the growth of the short leg to catch up and equalize. While limb lengthening can be performed at any age, an epiphysiodesis has to be performed at a very specific age in order to achieve a specific amount of growth slowing. We rarely use epiphysiodesis to achieve more than 5 cm (~2 in.) of limb length equalization. This covers the majority of cases of fibular hemimelia. In rare cases with larger discrepancies shortening of the femur or simultaneous lengthening of the femur and tibia may be preferred. The next step will be to determine the type of fibular hemimelia. At the initial consultation, it is determined whether the patient has a fixed foot deformity (or even a dynamic foot deformity) that will require surgical treatment. Fibular hemimelia is classified into different groups dependent on treatment strategies according to the degree of severity. Many different classification systems have for FH have been proposed, but these systems have historically prioritized amputation treatment. 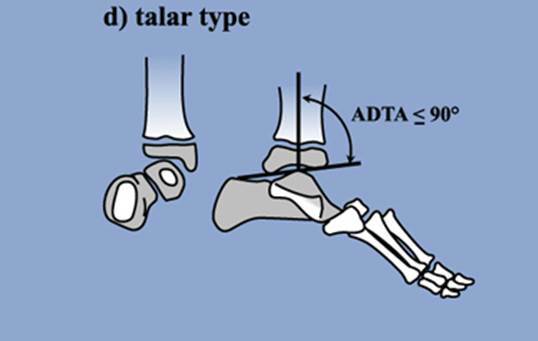 Paley Type 1 is a congenitally short tibia and fibula with a stable ankle joint. In many cases, the ankle of Type 1 cases appears completely normal and the fibula is only slightly shorter at its upper end compared to the opposite side. The predicted limb length discrepancy in Type 1 cases is typically less than 7 centimeters (3 inches). 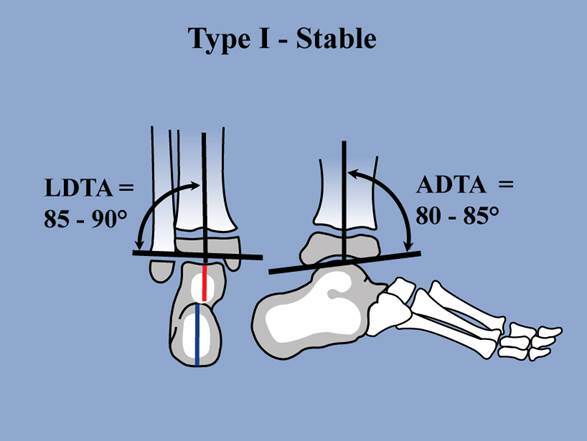 Type 1 FH is also referred to as the Stable type due to the stable ankle joint. Most patients with Type 1 do not require any foot surgery. In many of these cases, lengthening of the tibia and fibula will address the deformity. Paley Type 2 cases have a short tibia and fibula with a foot that stands flat to the ground but often goes into a valgus position (pointing outward). The foot can come into a normal position, but as the child gets older or more tired, the foot goes into valgus such that the heel is pointing outwards and the ankle is pointing inwards. Patients with Type 2 often have a tight Achilles tendon and a ball-and-socket ankle joint as well. 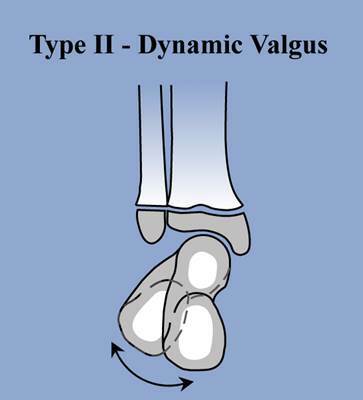 Type 2 FH is also referred to as the Dynamic Valgus type due to the nature of the ankle deformity. Most patients with Type 2 will require realignment of the ankle, combined with lengthening of the gastrocsoleus muscles (the two muscles connected to the Achilles tendon). This should be planned and included as part of the lengthening procedure. Paley Type 3 cases demonstrate a fixed foot deformity, also known as a fixed equinovalgus deformity, with the foot pointing down and to the side. The foot has limited mobility and cannot be brought into a plantigrade (flat on the ground) position relative to the lower leg. While the more common foot deformity known as clubfoot has the foot pointing down and in, Type 3 fibular hemimelia is the opposite, with the foot pointing down and out. 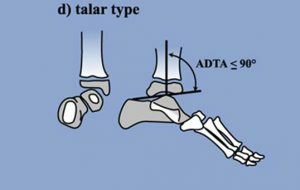 Type 3 is the type of deformity that has malorientation of the ankle joint and/or malunited subtalar coalition. Type 3 has fixed deformities that must be corrected early to allow the patient to walk with the foot flat on the ground and to be able to wear a shoe properly. Type 3 FH is treated by the SUPERankle procedure (SUPER is an acronym for Systematic Utilitarian Procedure for Extremity Reconstruction). The SUPERankle was developed by Dr. Paley in 1996. 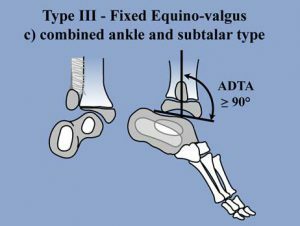 It is the most successful method to correct the fixed equinovalgus of Type 3 (or fixed equinovarus of Type 4) fibular hemimelia. The SUPERankle procedure is the most revolutionary advancement in the treatment of fibular hemimelia. Prior to the advent of this surgery, the biggest cause of failure of surgical reconstruction was recurrent foot deformity. The SUPERankle is the first and only procedure that has reduced and almost eliminated recurrent foot and ankle deformity following treatment of fibular hemimelia. The previous surgeries, such as soft tissue releases or joint distraction, had very high failure rates and led to increased or permanent stiffness. The SUPERankle procedure combines extra-articular soft tissue releases with intra-articular reshaping of the ankle joint with extra-articular osteotomy bony alignment of the ankle and subtalar joints. It is a very technically demanding surgery. At first consultation, a determination if the SUPERankle procedure is required will be made. If the procedure is to be performed on its own, it can be done as early as 12 months of age. If it is to be performed in combination with lengthening, it is preferable to wait until 18 months of age. The SUPERankle can be performed at an older age if necessary. Type 3 cases are further subdivided into four types. 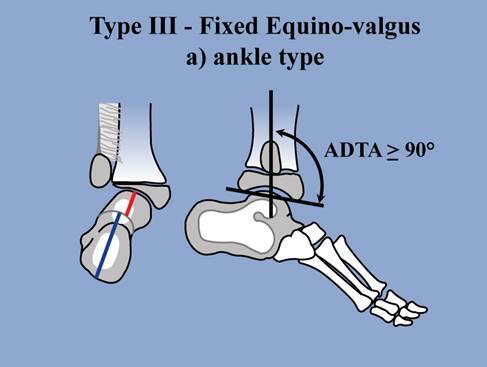 In Type 3A, the fixed equinovalgus deformity is due to a malorientation of the ankle joint. For that reason, Type 3A FH is also referred to as Ankle Type. 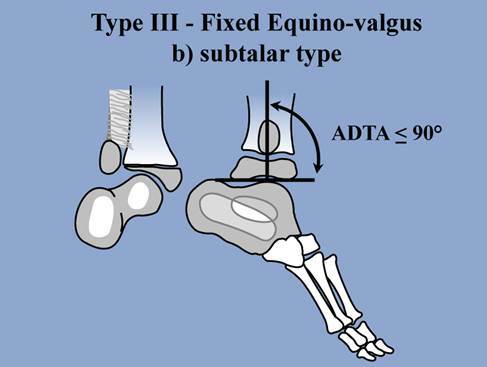 In Type 3B, the fixed equinovalgus deformity is due only to a malunited subtalar coalition. Type 3B FH is also referred to as Subtalar Type. 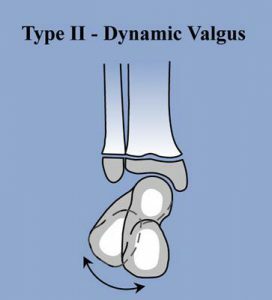 In Type 3C, it is due to a combination of maloriented ankle joint and a malunited subtalar coalition. 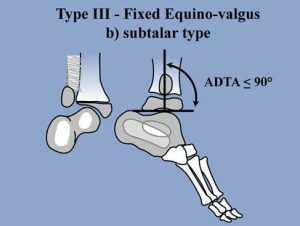 Type 3C is also referred to as Combined Ankle and Subtalar Type. In Type 3D, the subtalar joint is not fused and does not have the coalition but is nonetheless maloriented. In fact, in this condition, there is hypermobility of the subtalar joint. Type 3D FH is also referred to as Talar Type. The differences in anatomy of the different subtypes for Type 3 FH require different variations of the SUPERankle procedure. Paley Type 4, also known as the clubfoot-type of fibular hemimelia, has a subtalar coalition maloriented into varus (foot turned inwards) and appears more like a clubfoot deformity instead of the equinovalgus deformity typical of fibular hemimelia. This equinovarus, or clubfoot deformity, can often be mistaken for true clubfoot. The treatment for true clubfoot is by manipulation and Ponsetti casting, typically followed by an Achilles tendon lengthening. A fibular hemimelia case mistakenly treated by this method would fail to correct. Furthermore, such manipulation in the presence of a subtalar coalition can damage the ankle joint and growth plate of the lower tibia. Therefore, correct diagnosis is crucial to prevent incorrectly treating fibular hemimelia as clubfoot. Type 4 FH is treated with the SUPERankle procedure. Since no treatment is required prior to walking age, there is no urgency in the timing of the first consultation. Dr. Paley usually recommends coming in when your child is around six months of age and to treat the child normally until that time, with no specialized braces, shoes, or physical therapy. It is a common misconception to perform physical therpay prior to surgery. Physical therapy, if performed inappropriately, can actually be harmful to the foot. Dr. Paley highly recommends against any manipulation therapy of the foot and ankle, including casting or bracing prior to surgery. The first intervention is the use of a shoe lift at the time of walking. Children with fibular hemimelia learn to walk either at normal age or slightly delayed. All of them will walk and can walk with FH even in very extreme cases. There is no neurologic obstruction to learning to walk in children with FH. Once the child demonstrates that they are “cruising the furniture,” it is then appropriate to obtain a shoe lift. In most cases, an ankle foot orthotic (AFO), which is custom-molded to the foot, is recommended. Then a shoe lift is added to the bottom of the shoe to equalize the limb length discrepancy. After that, the child should be booked for the first surgery—typically a SUPERankle procedure between age 12 and 18 months. No other treatment is required prior to the first surgery.